There is a truckload of Christmas cheer headed your way today! This card came together with a new holiday stamp and die set and new All About Plaid and All about Dots paper pads. Layers of the new paper pad papers were added to card as shown, then add a chalkboard tag. 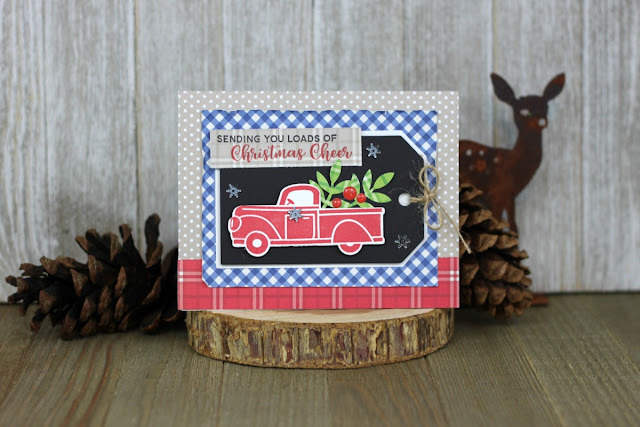 Once base is done then do your stamping using red and black ink for the truck and the sentiment. Last punch the greenery and add to the truck bed with epoxy red sticker dots.